Which projects should our organization invest in? How can we optimize our organization's capacity? How well are we executing the PPM process? Can our organization absorb all the changes that our PPM plan requires? Are we achieving all the expected benefits? 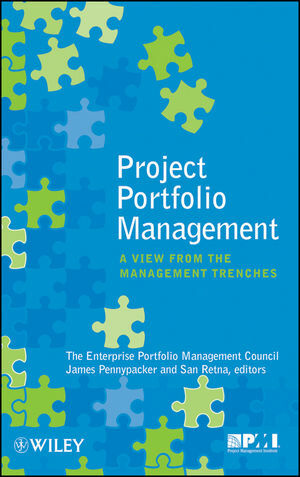 The authors are all members of the Enterprise Portfolio Management Council, a group of senior portfolio management executives dedicated to helping organizations develop their own portfolio management capabilities. Now you can benefit from their collective wisdom and experience, and duplicate their successful results within your own organization. James Pennypacker has directed benchmarking projects on management topics, including strategy and projects, portfolio management, PMOs, and process maturity. He is the author/editor of several books, including Seven Steps to Strategy Execution, Project Portfolio Management Maturity Model, and Managing Multiple Projects. San Retna has spent over twenty years deploying and operating project, program, and portfolio management capabilities. He is the Vice President of IT Effectiveness at Safeway, Inc. As a thought leader, he has been profiled in numerous publications including CFO magazine, CIO magazine, Computerworld, and PM Network. Case studies of successes have also been published by Gartner, Corporate Executive Board, and the Project Management Institute. Why We Created the EPMC. Why We Wrote the Book. The Five Questions in Brief. The PPM Players and Roadmap. A Few More Questions to Get the Mental Synapses Firing. Part II Project Portfolio Management: A Story. 10 Years Ago . . .. Present Day . . ..
Later that afternoon . . ..
3 Are We Investing in the Right Things? EPMC Working Document on Portfolio Investment. 4 Are We Optimizing Our Capacity? EPMC Working Document on Portfolio Resource. 5 How Well Are We Executing? 6 Can We Absorb All the Changes? Modeling the Impact of Change. EPMC Working Document on Enterprise Change Management. 7 Are We Realizing the Promised Benefits? Key 1: Ensuring All Benefits Claimed Are Robust and Realizable. Key 2: Capturing All Value Created. Key 3: Moving beyond Benefits Realization to Value Creation. EPMC Working Document on Benefits Realization. The Business Case and Project Management Plan. 9 Setting the Foundation for Success. Tying It All Together: People, Process, Technology. Source of Data and Information Related to Decision Criteria. Drawing ‘‘The Line’’ in the Portfolio. Link to the Business Case. Governance Board (Decision Review Board). Dashboards and Metrics: The Visuals. Meetings: Keeping the Process Going. Communication: Making Sure Everyone Is on the Same Page. Maturity Models: Where Do You and Your Organization Stand? Resource Management: Getting Your Arms around the Organization. Dedicating Resources to Running the PMO. Part IV The Story: Nine Months Later. 13 Bringing It All Together.